Which Premium Amex Card Is Right for You: The Platinum Card vs Delta Reserve? Have you been thinking about stepping up to a premium travel rewards card? American Express, which is known for its excellent customer service and products, has two high-end travel card offerings you should consider: the Platinum card and the Delta Reserve card. The Platinum card is part of Amex’s excellent Membership Rewards program, whereas the Delta Reserve card is tied to Delta’s loyalty program, SkyMiles. They’re both top-of-the-line cards that offer a lot of cardholder perks and benefits, making them a valuable addition to your credit card arsenal, particularly if you travel a lot. But those perks come at a price. These cards each have a $450 annual fee. That may sound scary, but if you use the benefits that come with the cards, you can more than make up for their cost. So which of these best-in-class Amex cards is right for you? Which one has the benefits you’ll use most? In terms of raw numbers, the Platinum card seems to be the obvious winner in this category. After spending $3,000 in three months, you’ll get 40,000 points, which is four times larger than the Delta card’s bonus. There’s more to what the Delta Reserve card has to offer, though. The 10,000-mile sign-up bonus, which you’ll get after your first purchase, is small, but you’ll also get 10,000 Medallion Qualification Miles (MQMs) that count towards elite status. That’s almost halfway to Silver status, which comes with some great perks, such as complimentary upgrades and bonus miles on flights. MQMs aren’t as easy to earn as standard SkyMiles, so this unique perk can be quite valuable if you often fly Delta often or are trying to achieve status. That’s not the only bonus you’ll get with the Delta card, either. If you spend $30,000 on your card in a calendar year, you’ll get another 15,000 SkyMiles and MQMs. With the sign-up bonus, that’s enough MQMs to get Silver status without ever leaving the ground. If you manage to make $60,000 in purchases in a year, you’ll get a total bonus of 30,000 miles and MQMs. That’s just 10,000 MQMs short of Gold status. Plus, those bonuses are available every year, not just the first year of having the card. That makes the Delta Reserve card an excellent option for maintaining elite status and earning free flights if you can spend enough on your card. This is where the Platinum card shines. As part of the Membership Rewards program, you aren’t tied down to one airline. You can transfer your points to 16 different frequent flyer programs. Among those partners are Delta, British Airways, ANA, Air France, KLM, JetBlue and Virgin America. If you’re into over-the-top luxury, you can also transfer points to Emirates and Singapore Airlines, both of which feature first class suites and amazing service in any cabin. You’ll have access to all three of the major alliances—SkyTeam, the Star Alliance and oneworld—with the Membership Rewards program. The Membership Rewards travel website allows you to buy airfare and other travel at their cash value and pay for part or all of it with points. Though you’ll often get more value for you points by transferring them to frequent flyer programs, this can be a great benefit, particularly if award seat availability is limited on the flights you want. With the Delta Reserve card, you’ll have to book all of your award travel through Delta. Obviously that’s way less flexible than the Membership Rewards program, but you aren’t limited to just Delta flights. You can use your SkyMiles to book flights on the 20 SkyTeam alliance members. It’s worth reiterating that the Membership Rewards program is an airline transfer partner with Delta. You could, then, transfer any points you get with the Platinum card to Delta. Neither card offers the fantastic triple or quintuple points on select purchases like some other cards do, such as Chase Freedom and Amex Premier Reward Gold. You can, however, earn double points on Delta purchases with the Delta card and on Membership Rewards travel purchases with the Platinum card. If you’re interested in making purchases through a rewards program’s website, the Platinum card offers far more flexibility for earning double points. Not only can you buy airfare through Membership Awards, but you can also pay for car rentals, hotels, entertainment and more with your points. The best perk of the Delta Reserve card is the free annual Companion Certificate you’ll receive when you renew your card. With this certificate you can take a friend or family member with you for free on a domestic round-trip flight in either economy or first class. Depending on what ticket you purchase, this benefit alone could pay for the card’s annual fee. The Platinum card doesn’t come with anything quite as nice as that, but you do get up to a $100 fee credit towards TSA PreCheck or Global Entry. With either of those programs, you’ll zip through airport security lines. The card also comes with a $200 statement credit towards incidental airline fees. That’s handy for covering checked bags and change fees, and helps makes up for the airline-specific benefits you’ll be missing out on without having the co-branded card. For example, the Delta card includes a free checked bag, priority boarding and 20 percent discount on in-flight purchases. If you fly often, you know that airport lounges can make waiting for your flight much less painful, particularly on long layovers. With the Delta card you’ll get free admission to Sky Club lounges and discounted access for two guests. Note that you have to be flying with Delta to take advantage of this perk. 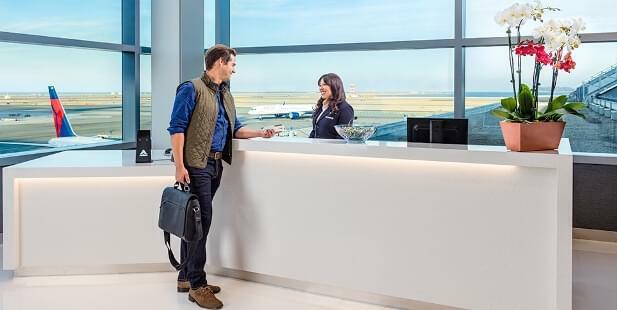 The Platinum card’s lounge benefits are much better, giving the cardholder access to not only the swanky Centurion Lounges, but also Delta Sky Clubs. You’ll even get reimbursed for a Priority Pass Select membership, which gives you access to over 850 lounges around the world. The Delta and Platinum Amex cards both come with the cardholder perks you’d expect from a premium travel card. Neither charges foreign transaction fees, plus they offer personal concierge service, a Global Assist hotline, roadside assistance, return protection, car rental loss and damage insurance, purchase protection and travel accident insurance. The Platinum card comes with some benefits that aren’t included with the Delta card. The best perk is elite status with Hilton HHonors and Starwood Preferred Guest (SPG) hotel loyalty programs. Gold status with these programs gives you all sorts of benefits, including extra points for stays, room upgrades, late checkout, free Wi-Fi and more. The Platinum card also gives you a $75 credit towards dining and resort activities when you book a two-night stay through the Hotel Collection, plus free Boingo Wi-Fi at any of its hotspots. Both cards have a substantial $450 annual fee, but if you use the benefits, they can easily cover their own cost. There’s no doubt that the Platinum card is a lot more flexible in terms of how you can spend and earn points. Access to the Membership Rewards program and its 16 airline transfer partners, plus double points for travel purchased through the website are great benefits. You’ll also get free access to a lot more airport lounges, no matter which airline you’re flying on, plus elite status with SPG and HHonors. The TSA PreCheck/Global Entry and airline fee credits that come with the Platinum card are also nice. As far as value goes, though, they don’t really make up for the free companion ticket you’ll get annually with the Delta Reserve card. If you use the companion certificate wisely, it can be worth more than the Platinum card’s fee credits and maybe even cover the card’s annual fee. The Platinum card’s decent sign-up bonus is notably better than what you’ll get with Delta Reserve. The Delta card makes up for this shortcoming, though, by helping you earn and maintain elite status with Delta. Not only will you get 10,000 MQMs towards status with your first purchase, but if you spend enough on your card you can get 30,000 MQMs and SkyMiles annually. That’s enough for a domestic round-trip ticket and Silver status. In short, if I flew on Delta a lot, I’d probably get the Delta Reserve for the free companion ticket and bonus MQMs. 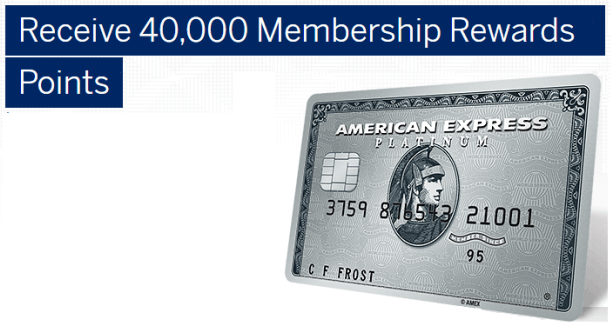 Otherwise, the Amex Platinum card is hard to beat for its flexibility.